Ms. Joy Angela DeGruy holds a Bachelor of Science degree in Communication, a Master's degree in Social Work (MSW), a Master's degree in Clinical Psychology, and a PhD in Social Work Research. Ms. DeGruy is a nationally and internationally renowned researcher and educator. 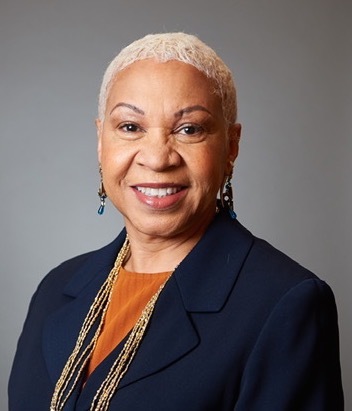 For over two decades, she served as an Assistant Professor at Portland State University’s School of Social Work and now serves as President and Chief Executive Officer of Joy DeGruy Publications Inc.
Ms. DeGruy’s research focuses on the intersection of racism, trauma, violence and American chattel slavery. She has over thirty years of practical experience as a professional in the field of social work. She conducts workshops and trainings in the areas of intergenerational/historical trauma, mental health, social justice, improvement strategies and evidence based model development. Ms. DeGruy has published numerous refereed journal articles and book chapters and authored her seminal book entitled “Post Traumatic Slave Syndrome: America’s Legacy of Enduring Injury & Healing.” She has also developed an assessment scale for measuring respect with regard to African American male youth.